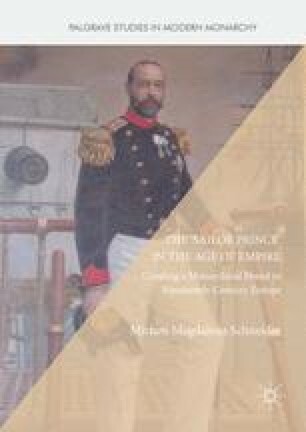 This chapter enquires into the public images that the ‘Sailor Princes’ enjoyed in the nineteenth-century mass media and consumer market, conceiving them as both a new kind of royal celebrities and as personality brands. The chapter examines how the princes were staged as kinds of modern adventure heroes in a range of media from family journals and the sensationalist press to children’s novels and consumer products. It studies the mechanisms and the various agents (court advisors, journalists, painters, entrepreneurs, etc.) who were involved in the popular representation of the ‘Sailor Princes’. And it investigates how these public personae provided intriguing prisms for the dissemination of the navalist and imperialist ideologies as well as for the inculcation of potentially system-stabilizing, monarchist values. Bassett, Marnie, and Bernard Smith. 2017. Brierly, Sir Oswald Walters (1817–1894). Australian Dictionary of Biography. Website. Available at: http://adb.anu.edu.au/biography/brierly-sir-oswald-walters-3054/text4495. Kronauer, Iris. 2017. Vergnügen, Politik und Propaganda. Kinematographie im Berlin der Jahrhundertwende, 1896–1905 [unpublished PhD]. Berlin: Humboldt-University. Available at: http://www.iriscope.de/index. Tipping, Marjorie. 2017. Chevalier, Nicholas (1828–1902). Australian Dictionary of Biography. Website. Available at: http://adb.anu.edu.au/biography/chevalier-nicholas-3200.